Sorting playlists by various criteria. %length% Playlist's length (duration), formatted as [WK][D][HH:]MM:SS. %length_hours% Playlist's length (duration), formatted as [HH:]MM:SS. %length_seconds% Playlist's length (duration), in seconds, formatted as an integer. %filesize_natural% Formatted total filesize of the playlist (e.g. 62.1GB or 322KB). %list_index% Index of the playlist. %list_total% Total number of playlists. %_list% Special field to separate rendering of control (when it's closed) and the list (to be used as a switch for $if()). Auto-assigning icons to playlists using their name/lock/size etc. (titleformatting?) (0.7. I don't think i'll use it because i like to be able to see all the play lists at once, but i like what i can see in the picture. The different icons especially are really awesome (even if you can't configure them yet), i wish the regular play-list switcher had that. I took the icons from foosion's Playlist Switcher plugin (on his approval, of course). Yup, it might look like that, because font is too small (exactly, 1 pixel too small ). Icons and text are both verically centered. I like the idea of this component alot! However, one thing which i like about playlist-tabs is how you can manipulate playlists via rightclicking, middleclicking, doubleclicking, etc. - I miss that functionality with this component. Oh? I didn't know he'd made such a plug-in, and i can't seem to find it on his page. Could you link me? Yup, it might look like that, because font is too small (exactly, 1 pixel too small ;)). Icons and text are both verically centered. Yes, I miss that too I'll try to add these functions as soon as possible. also coult it be possible to use global variables from a columns ui config? I'm pretty sure everything you just said was addressed in the list at the end of the first post. Very cool plugin, man. Kudos. Wow. Awesome. Gonna try it now. I never thought anyone would make this when I asked for it a month or so back. oi, mixcherry, thanks a lot! i was hoping for just a simple dropdown box ... and you came out of the blue with something much more than that! how do you guys get that playback queue? 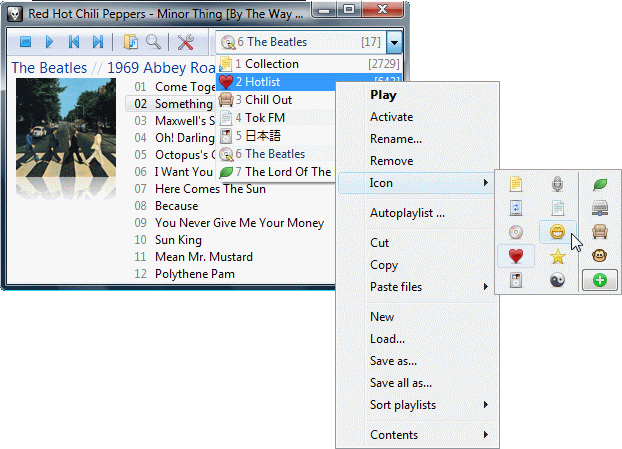 then go Playback - Playback Queue Viewer, I can select a playlist for this to be used for. ok it seems there is a limit to the playback queue of 64 tracks is this correct? Where do you get the Playback Queue Viewer? It's not listed in my Playback menu. It requires foo_common also available at this page. Thanks! This is not my last word!! what about automatic sorting alphabetically? how do you activate it? I am keen to use this plugin but I can't see how to turn on the dropdown list. I have the plugins from the stable package off foosion's site and am using Columns ui on foobar 0.91. All you need is the latest Columns UI plugin (remember to activate it here: Preferences -> Display -> User interface module /reset/). Then, you can simply add my component to your toolbar (right-mouse-button on toolbar and Toolbars -> Playlists Dropdown) or add it as a panel - using Columns' Layout page (Preferences -> Display -> Columns UI -> Layout). BTW I recommend a reset button to return to the default settings and code.